Free Kid | A Savings WOW! 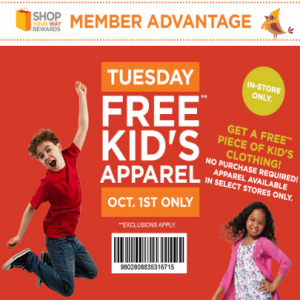 Tomorrow, Tuesday, October 1st, stop by your participating Sears and pick up your free kid’s apparel. No purchase required and you don’t need a coupon. You just have to use your free Shop Your Way Rewards card to get the free apparel, so be sure to sign up for one if you have not already. It is limit one piece per customer. Excludes outerwear.